Across the Ecuadorian Andes, its people are known for their rich culture and for welcoming visitors with open arms. Throughout these highlands, also known as the Sierra, or Páramo in Spanish, you will find remarkable natural diversity. The Andes mountain ranges stretches up and down Ecuador boasting mountainous lakes, cloud forests, haciendas with panoramic views of colossal volcanoes, colonial towns named World Heritage Sites, and centuries old Indian Markets. 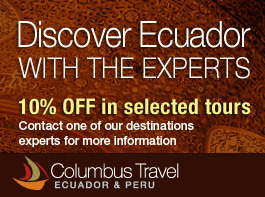 Columbus Travel has provided you with the best of all the Ecuadorian Andes with a great mix of tours seen below. The Northern Andes are made up of mountainous landscapes with sparkling lakes and lagoons, sweeping hills, small towns and villages overflowing with strong traditions and customs. Traveling North from Quito you'll first come to Cayambe, also home to the volcano Cayambe and Ecuador's fourth largest product of importation, Ecuadorian roses. Secondly, you'll find yourself in Imbabura where another magnificent volcano of the same name sits and welcomes all adventurers who are keen on climbing, hiking, and mountaineering. Traveling further North you can try out your bartering skills with locals selling their Artisan made crafts, products and various produce in Otavalo, one of the oldest Indigenous Markets known world-wide. The Northernmost cities of Ecuador are Cotacachi and Ibarra. Cotacachi is famous for their hand made leather products and Ibarra is known as the white city and the first creators of the delicious helado de paila. This Ecuadorian treat is made in a bronze pan with ice shavings that were initially brought down from the Imbabura Volcano when it used to be snow covered, then mixed with fruit juices until it becomes thick like ice cream. The Southern Andes are just as exciting as the latter. This route along the Andes is also well known as the Avenue of Volcanoes. A long highway winds down and around the most majestic of all volcanoes, the Cotopaxi and the extraordinary Chimborazo - both are considered bucket list types of climbs. Continuing down this celebrated avenue is Quilotoa Lake sitting inside a volcanic crater, Ambato, a beautiful Andean town known for its colorful festivals and as the initial communication point between Quito and Riobamba long ago when there were no highways. Riobamba sits just a bit more South of Ambato at the base of Chimborazo. An interesting place to visit along this route is the Ingapirca site that consists of centuries old Incan ruins and remains. Columbus Travel provides tours to each of these visit-worthy locations, including the colonial city of Cuenca known for the production of the popular Panama Hats and its architectural design. And of course you can't forget the port city of Guayaquil with popular parks, museums, and the cities modern feel. Check out other popular Columbus Travel Tours and Hotels that our guests have chosen with our professional guidance: Peru Tours, Andean Short Trips, Quito Hotels and Guayaquil Hotels.